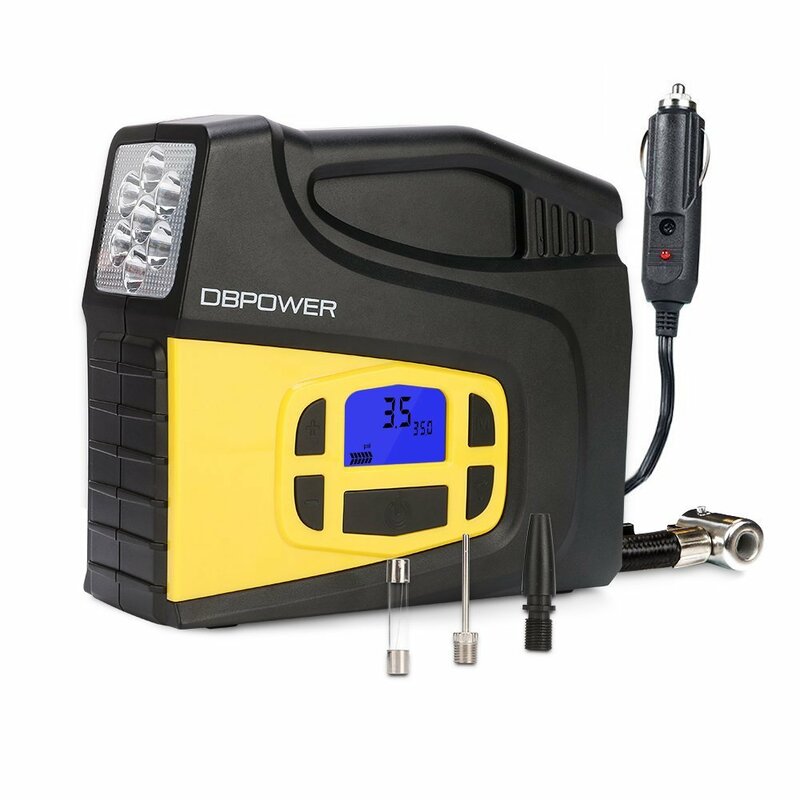 【Lighter but Faster】The DBPOWER tire inflator can inflate a standard mid-sized car tire from 0~35 PSI in less than 3 minutes. 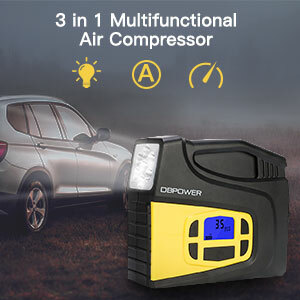 This compact air compressor with 0.75 KG net weight takes little space, can be placed in the car trunk, under the car seat and etc. 【Auto Off Function】Just need to press the “+” and “-” button can easily preset the desired tire pressure. 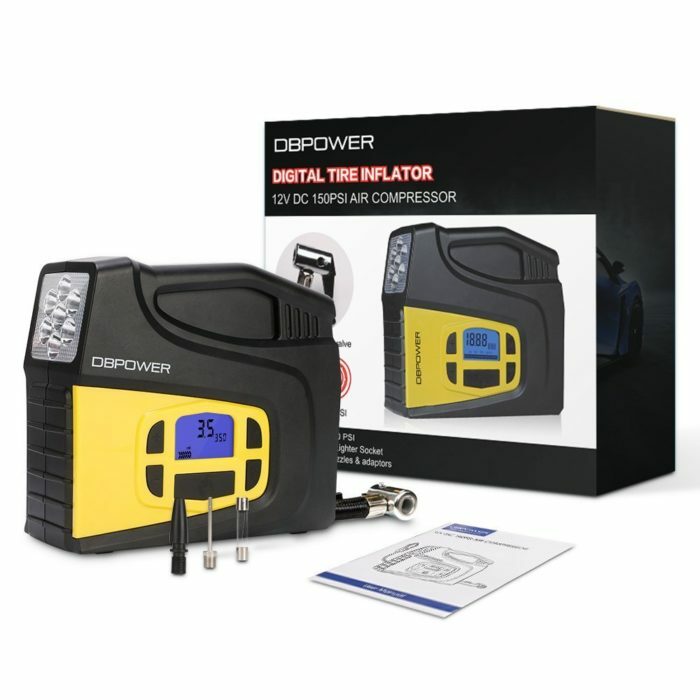 Once reaches the pre-set pressure, the air compressor will automatically turn off. Which can avoid over inflating causing damage to your car tires. 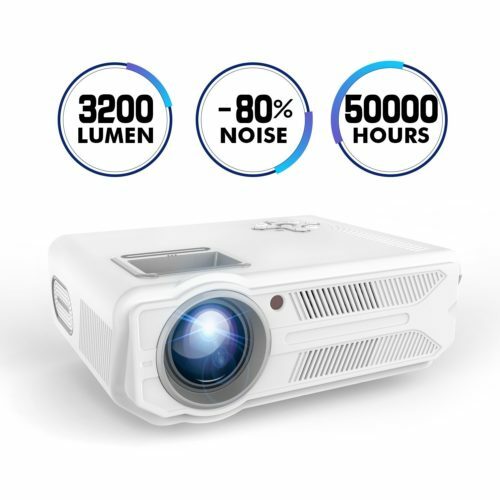 【LCD Display and LED Light】Built-in LCD display,it is more convenient for night vision. The tire pressure can be seen clearly, even if under the dazzling light and in the darkness. 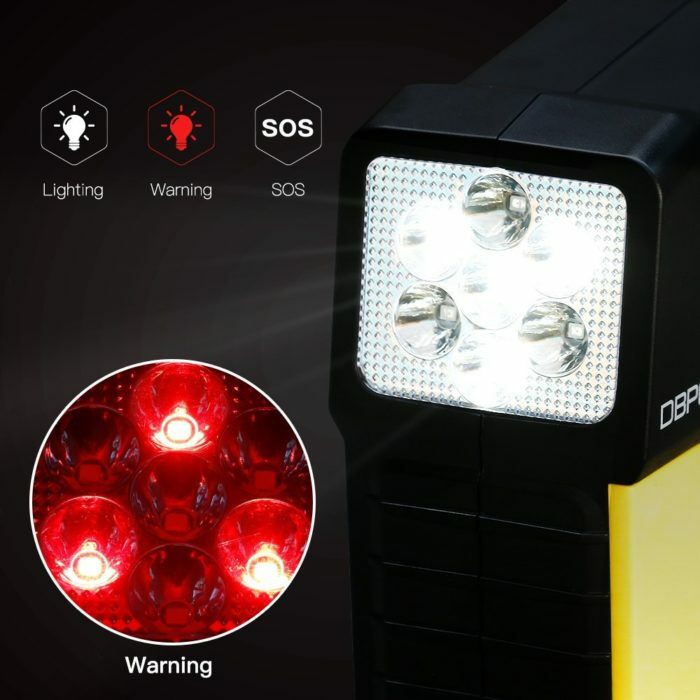 Equipped with LED light with 3 modes (Lighting, Warning and SOS), can be used as a additional flashlight. 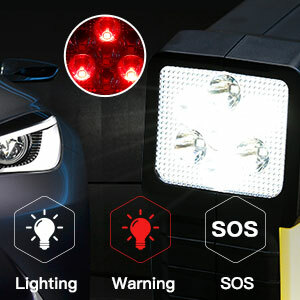 What’s more, the LED light can be as a hazard warning light to notify a traffic accident or call for emergency services. 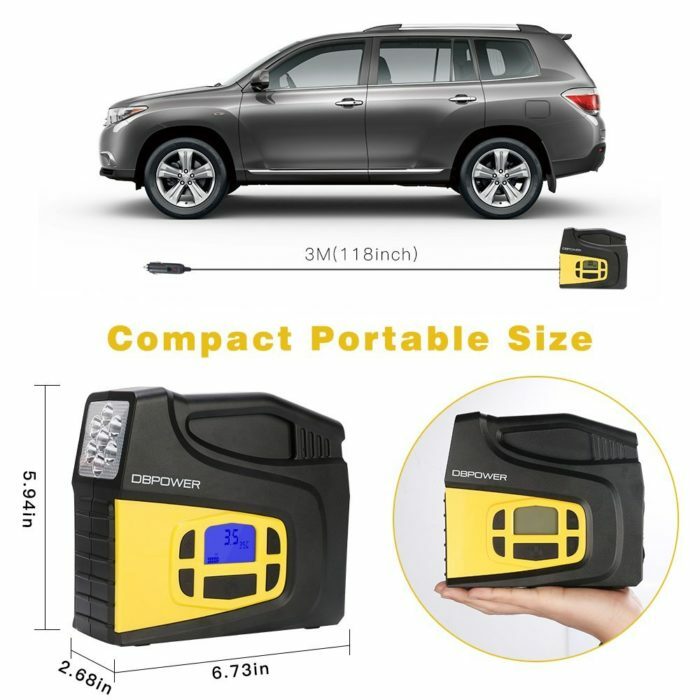 【Multifunctional and Practical】 With 3m line length power cord facilitates the air pump to inflate any of 4 tires easily. Besides, 2 nozzles design can be widely used to inflate cars, bicycles, balls and etc. 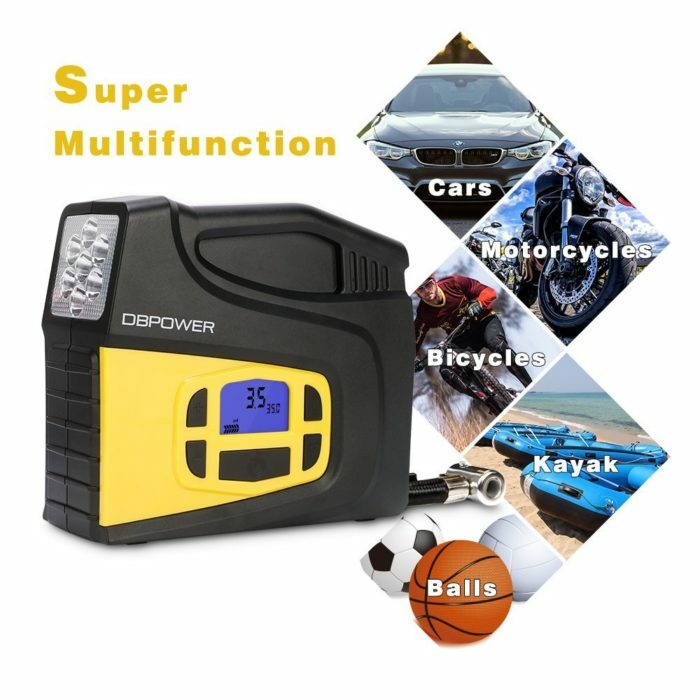 【Buy it Now!】All DBPOWER tire inflators are entitled of 24-months free warranty and lifelong customer service providing more professional, more timely service. What are you waiting for? Just add to cart and buy it now! – NOT suitable for RV, ATV, pickup and truck tires. – Do not exceed the stable working pressure of 50PSI. 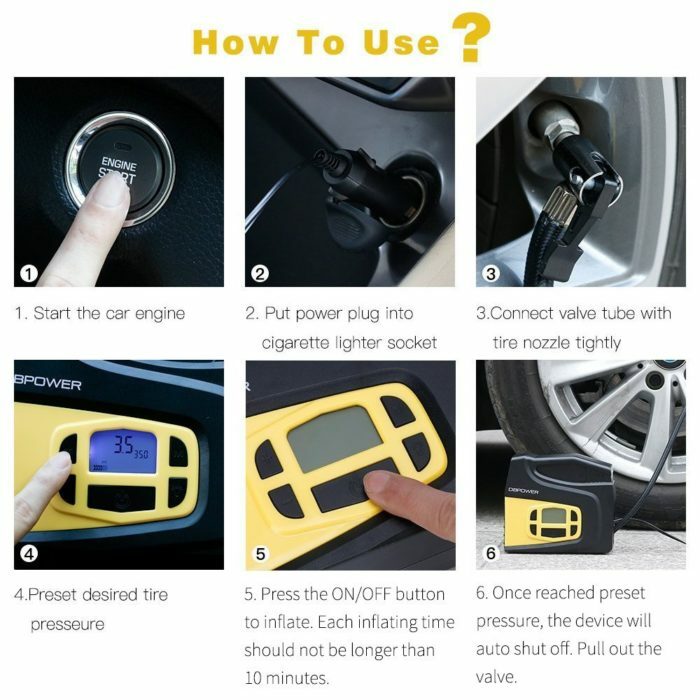 – Start the engine before plugging in the power cord. 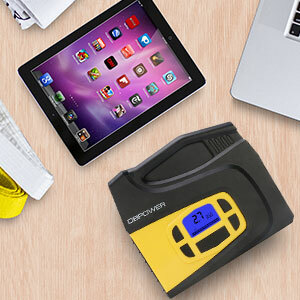 – The product only can be used on DC 12V power source, it can’t be used on AC 110V, AC 220V, DC 24V, DC 36V. 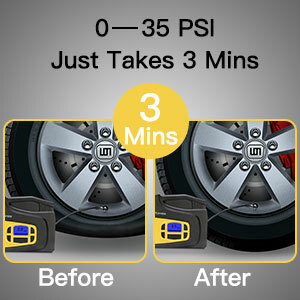 – The tire inflator should not be used longer than any 10-minute period. – Please allow the unit to cool down for at least 15 minutes after each use. It is dangerous when car tires burst or being flat. Are you still worrying about such danger? A tire inflator can dismiss your fears. DBPOWER tire Inflator was designed to inflate vehicles and other inflatable products. It can decrease possibility of accidents happens. It is a necessary good assistant in your life! This tool can be placed in the car trunk, under the car seat and etc. It can be used anywhere and anytime that can helps us timely to get out of troubles. 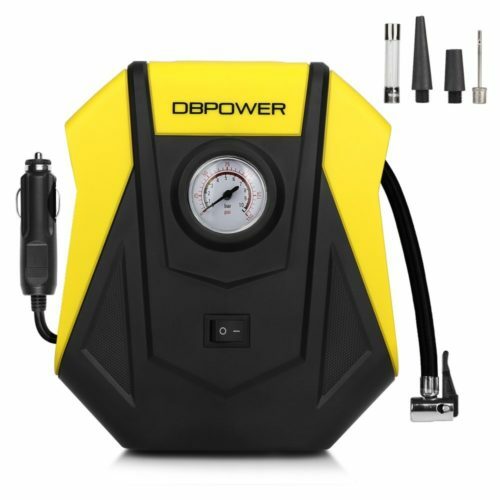 DBPOWER air compressor can inflate a standard mid-sized car tire from 0~35 PSI in only 3 minutes , max pressure up to 150 PSI. 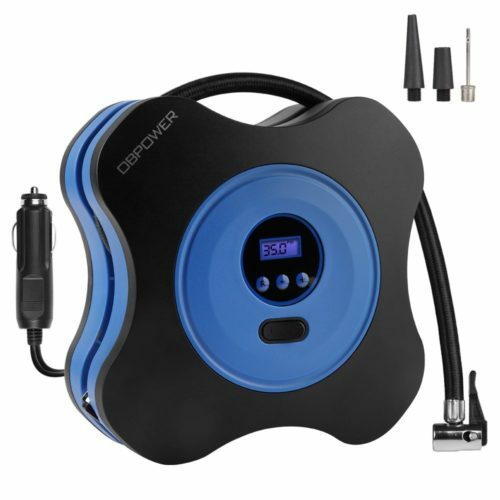 The inflating speed is faster than most other air pumps. 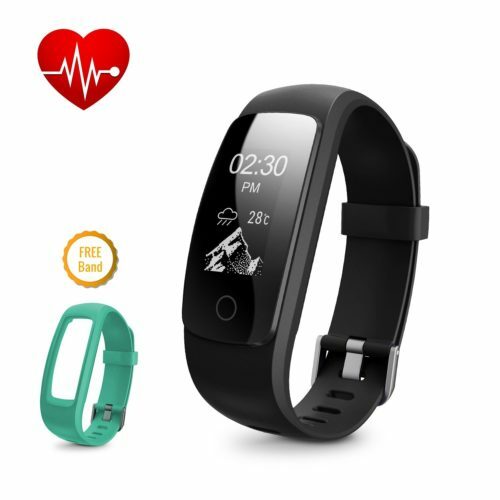 It largely saves your time and can make sure you can drive safely and quickly to the destination. 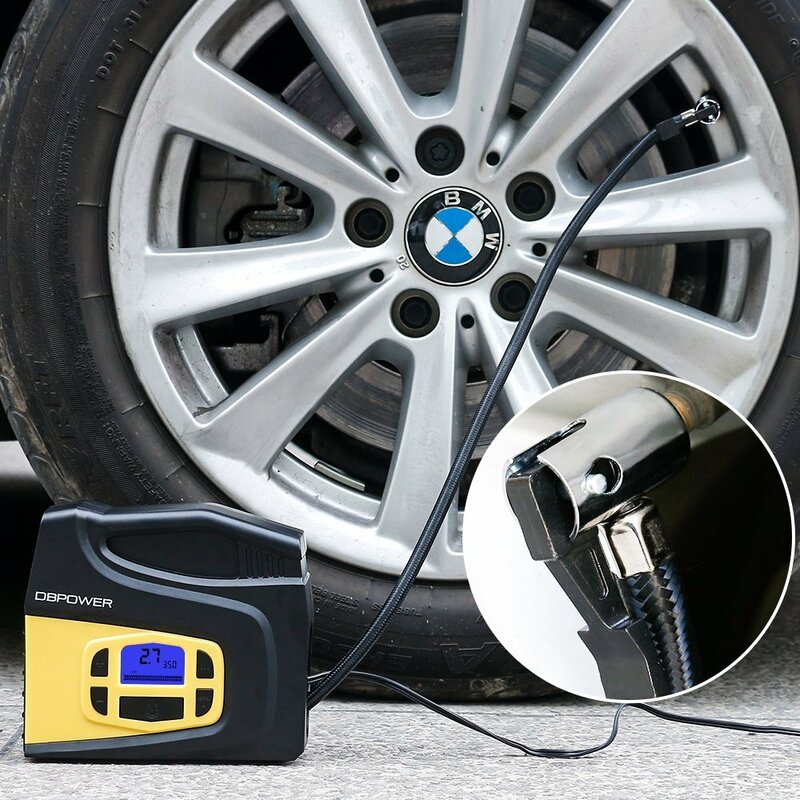 The portable tire inflator can be easily preset desired tire pressure by pressing the “M” button. 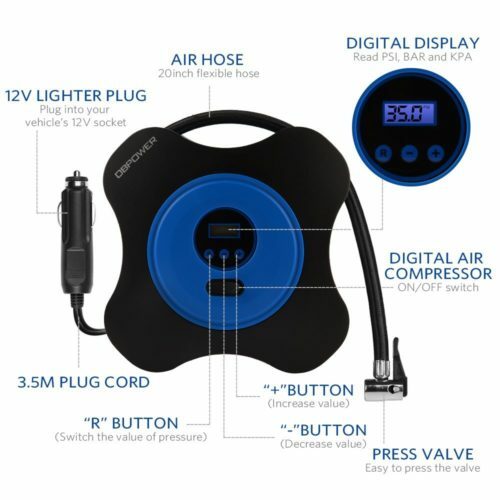 Once the pre-set pressure reaches, the air pump will shut off automatically. It decreases the odds of damaging car tires. 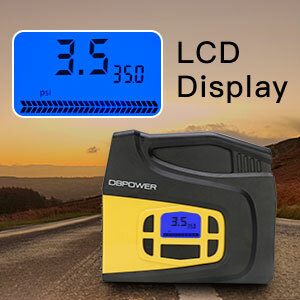 This tool with digital LCD display provides more convenient to read pressure for us.Even if for night vision, it still can be read clearly. 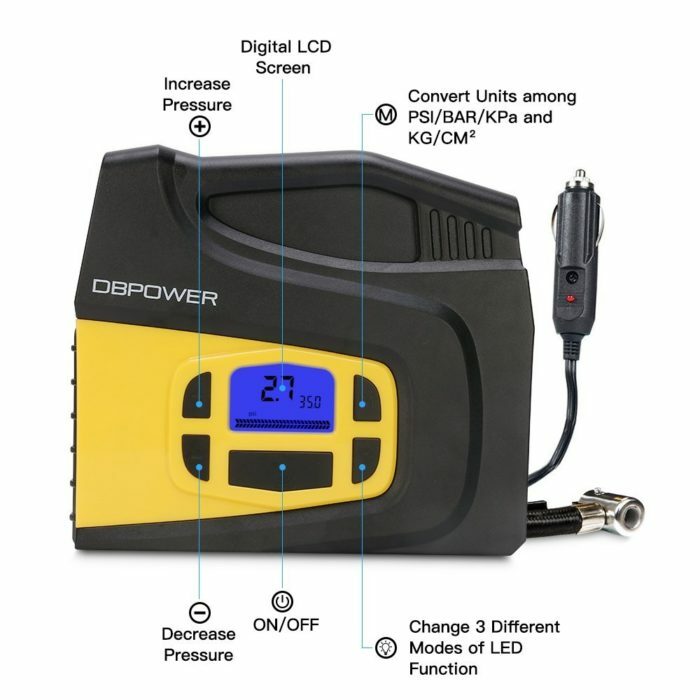 Unlike other tire inflators, this DBPOWER tire inflator is equipped with 3 modes of LED lighting(Lighting, Warning and SOS). 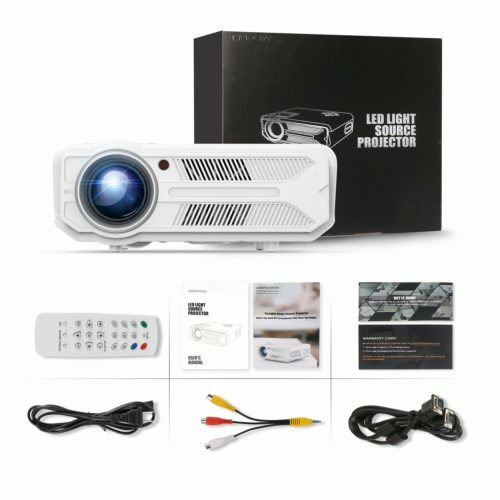 You just need to press the “LED “button once to start the lighting. 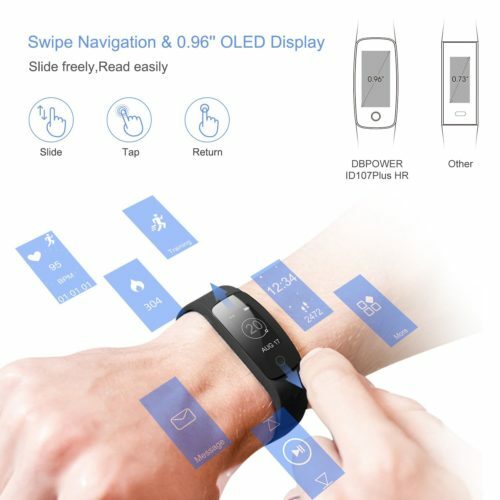 It is very easy to change different modes by pressing the “LED” button. 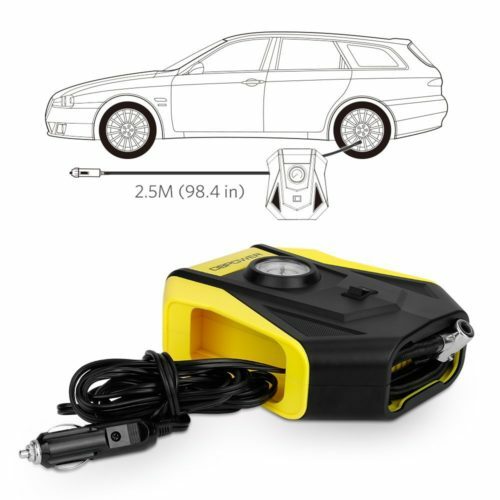 its very Good pump for car or bike，perfect size and very easy to use.perfect purchase. I just want to say it’s convenient! Balloons,basketball can be used! There is also a lamp that can be lit in the dark.